In 1861, the minister, Sir Andrew Buchanan, was authorised to negotiate a 21-year lease on a house at 12 Hooge Westeinde. It was originally built in the middle of the 15th century and rebuilt on the same foundations in 1754 by the Spanish minister to The Netherlands, which is why it was for long called the Hotel d’Espagne and was so conveniently laid out for grand diplomatic display. In 1811 the Spaniards sold the house to a wealthy Dutch Catholic and in 1838 it was given to the Jesuit Fathers, who pulled down the stables and chapel and built the Church of St. Theresa and their presbytery. The Jesuit Fathers leased the house successively to the French, Danish and Prussian diplomatic missions, all at small rent but with full repairing liability, before Buchanan took his lease on it. This was renewed by his successors several times between 1880 and 1912. The legation was raised to embassy status in 1919. In 1912, the Office of Works took a 25-year lease on the house, again with full repairing liability, from the Roman Catholic Council of the Parish of Saint Theresa. This lease was renewed in 1952, 1962 and 1974. In 1979, the ambassador, Sir Richard Sykes, and a Dutch footman were murdered by the Irish Republican Army outside the front door. 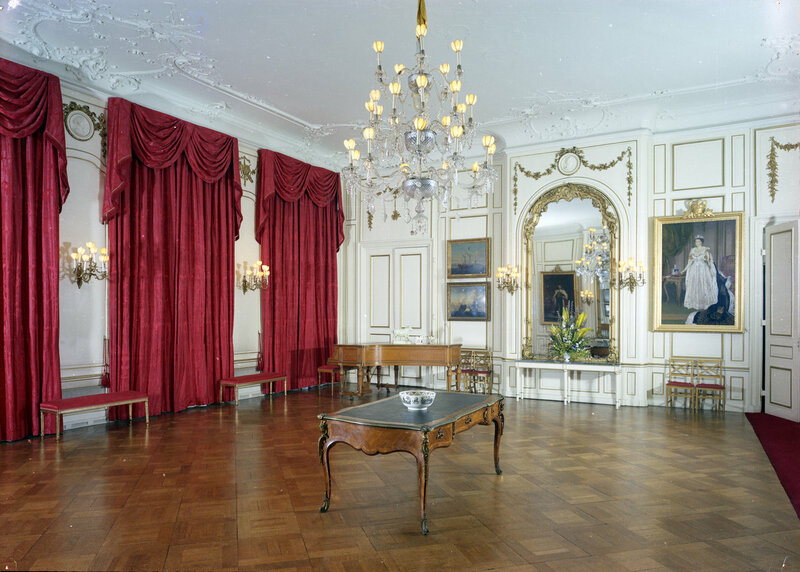 The Foreign Secretary, Lord Carrington, decided that this was not a reason to dispose of the house, but security in The Hague and elsewhere was stepped up. NOTE Sir Peter Garran, ambassador at The Hague 1964-70, wrote a history of the house, Westeinde 12 – The Embassy Story, that was published in Jaarboek 1966 / Vereniging Die Haghe, pp. 1-17 (illustrated). He drew extensively on the same material for a speech he gave in 1968, a copy of which is in The National Archives, WORK10/523. 12 Hooge Westeinde siteplan, 1924. Street facade, with entrance in forefront, 1946. 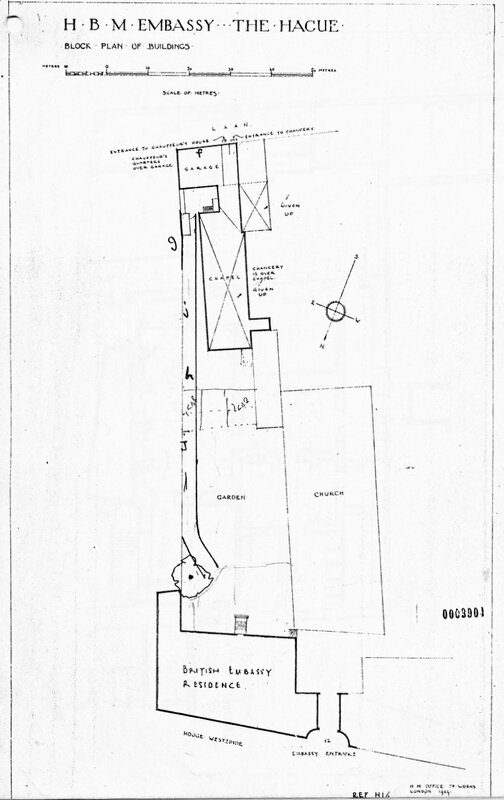 Ground floor plan of 12 Hooge Westeinde, 1946. Until the end of the Second World War, the offices were in the old garage block, 19 Laan, at the rear of 12 Hooge Westeinde, and above the chapel at the southern end of the garden. Some sections of the offices were then out-housed in leased premises. Richard Turner, senior architect from the Ministry of Works, visited in 1948 and, finding that the owners of war-damaged properties expected prospective tenants to fund most of the rebuilding costs, recommended buying a site and building new offices: but there was no money for that either. 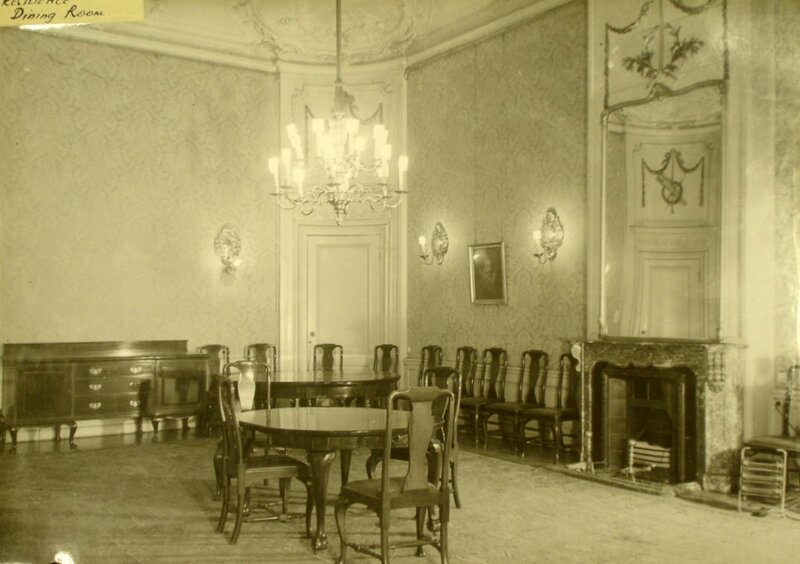 In 1952, the fine house at 32 Lange Voorhout was leased for ten years from the Swedish government and most of the offices brought together there: this accommodation was supplemented a few years later by the lease of 29 Lange Voorhout. At the end of 1961, a third house on Lange Voorhout, No. 10, on the corner with the sidestreet Kleine Kazernestraat, was bought for £25,000. The intention was to demolish the 400-year-old house at No.10 and replace it with a much larger new building that would house all of the staff, extending into the garden to do. Local objections, however, put a stop to that. The plan therefore changed to using the existing house, renovating it as necessary, and, since it was only capable of accommodating about a third of the staff, building a long, thin rear extension facing the sidestreet. 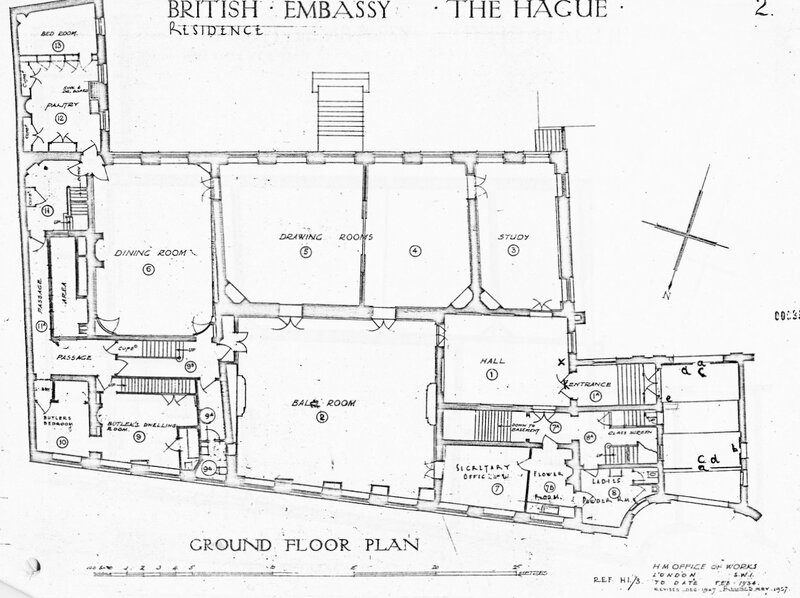 Sketch plans by a Ministry in-house architect, James Truscott, were agreed in mid-1965, tenders were invited a year later that resulted in Boele & Van Easteren being appointed as contractors, £348,000 was approved by the Treasury, and work started on site in September 1966. The local executive architect was WS Van den Erve. The contract went extremely badly: the face of the old building, which was to have been preserved, fell down; the Ministry’s drawings were found to be inadequate; Dutch building costs escalated and sterling devalued; the contractor stopped work to ensure that his financial claim would be taken seriously; and the press had a field day. The result was that the Treasury’s approved cost was exceeded by over £120,000 and the building’s completion was late. The Ministry of Works’ permanent secretary was called before the Public Accounts Committee in 1969 to answer for the Ministry’s shortcomings. 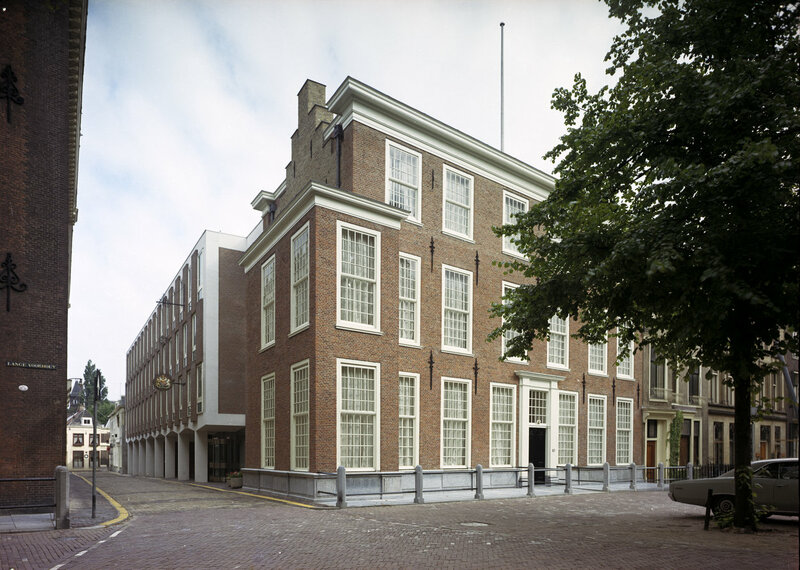 The new building was occupied in 1969, whereupon 29 and 32 Lange Voorhout were returned to their patient landlords. The search for an alternative residence ran in parallel with the debate about whether remaining in12 Hooge Westeinde was likely to be affordable. The search identified No.1 Plein 1813 as the most satisfactory likely alternative, and the financial and representational considerations pointed to its being preferable to Westeinde. The Plein used to be part of the Willemspark that the Municipality bought from the King’s estate in 1855. The house at No.1, originally called No. 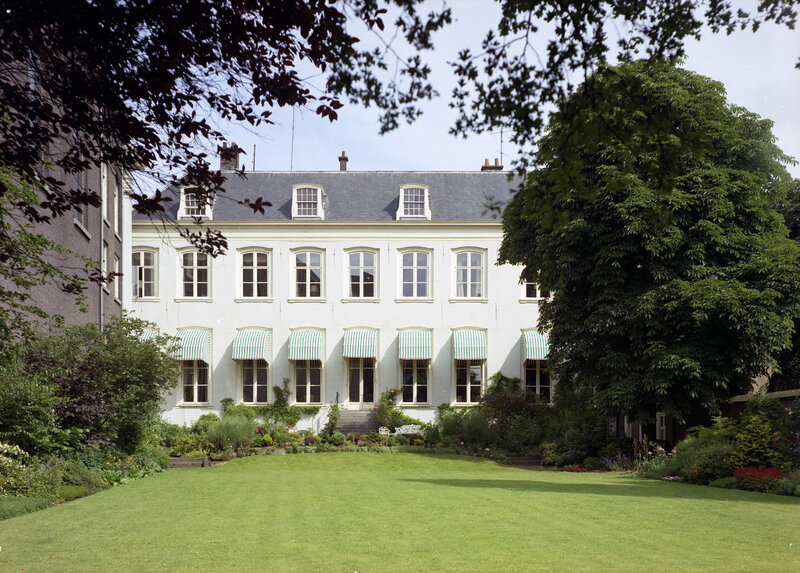 5 Sophialaan, was designed and built in 1863 by the architect Johannes Jacobus Delia for Dr Agnites Vrolik, who had served as minister of finance during the 1850s. It was very much a dignified stuccoed home of the period. In1889 it was sold to the Thurkow family, whose money came from sugar in the East Indies. 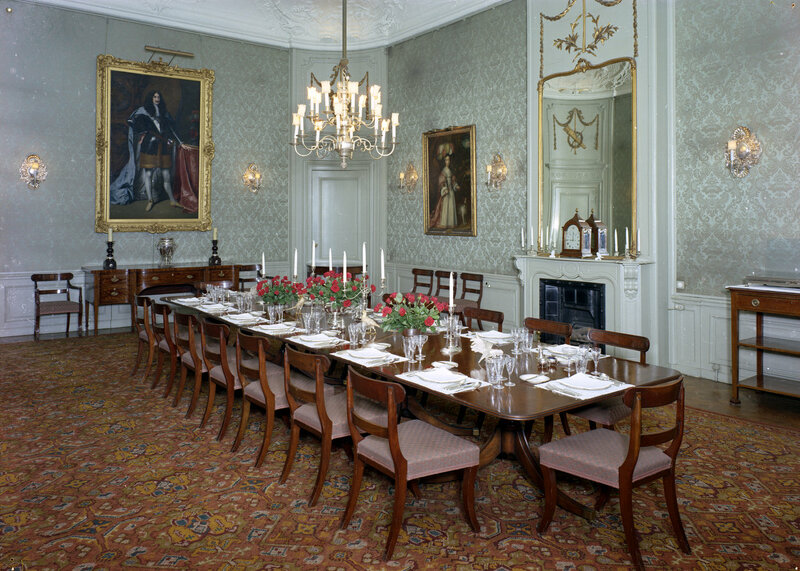 The next generation of the family made major alterations to the house in the early 1920s with their architect Sam de Clercq, including incorporating the interiors of rooms from elsewhere: the baroque dining room from a house in Delft, much of the Red Room from a 17th century house on the Keizersgracht in Amsterdam, and the ballroom from a house in Paris. The Dutch Nazi leader, Anton Mussert, commandeered the house in 1943 and moved into it with his wife (who was also his aunt): on returning to their house after the war, the Thurkows found that nothing had been damaged or stolen. They sold the house in the late 1970s to an insurance company, who leased it to Mr Haas Beyen, state secretary for economic affairs, until putting it on the market in 1983. The FCO bought the house for £850,000 in March 1984. 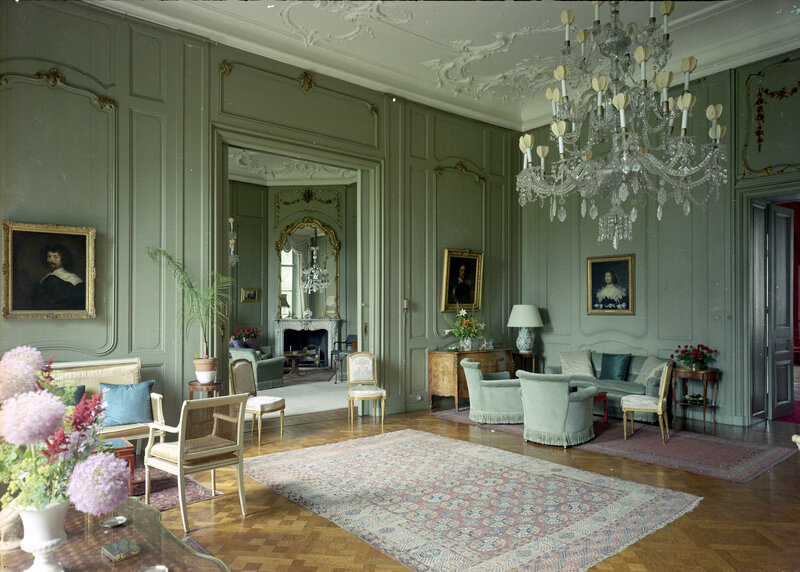 Ian Burn, a senior architect in the FCO, and John Cornforth, the FCO’s adviser on historic interiors, masterminded the ingoing works, and created a fine series of reception rooms, less grand but more inviting than Westeinde, and more in tune with changing times. The new residence was occupied in November 1984 and was readily accepted by incumbents and visitors. Offices were leased at Herengracht 460 from at least 1957, moved to 7 Johannes Vermeerstraat in 1971, and then to 44 Koningslaan, which was bought in 1982 for £235,000. 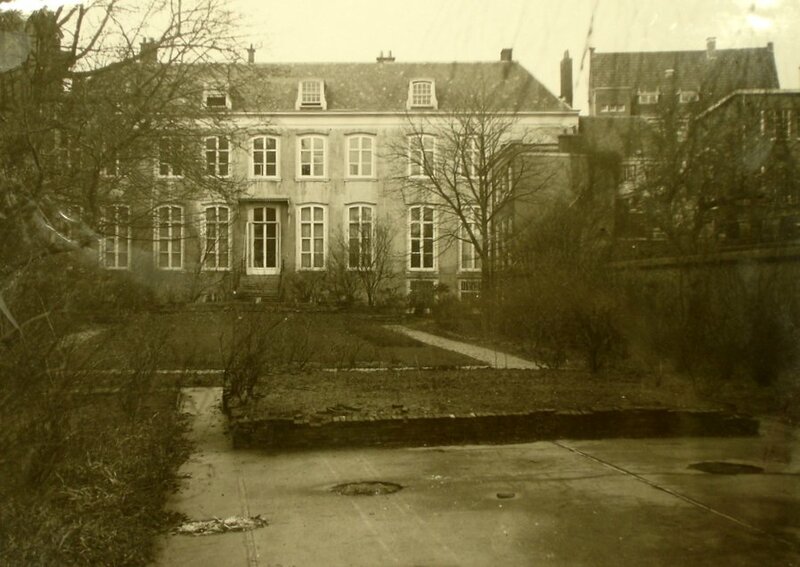 The residence at 13 Bernard Zweerskade was leased in 1929 and its perpetual leasehold bought in 1961 for £15,000. 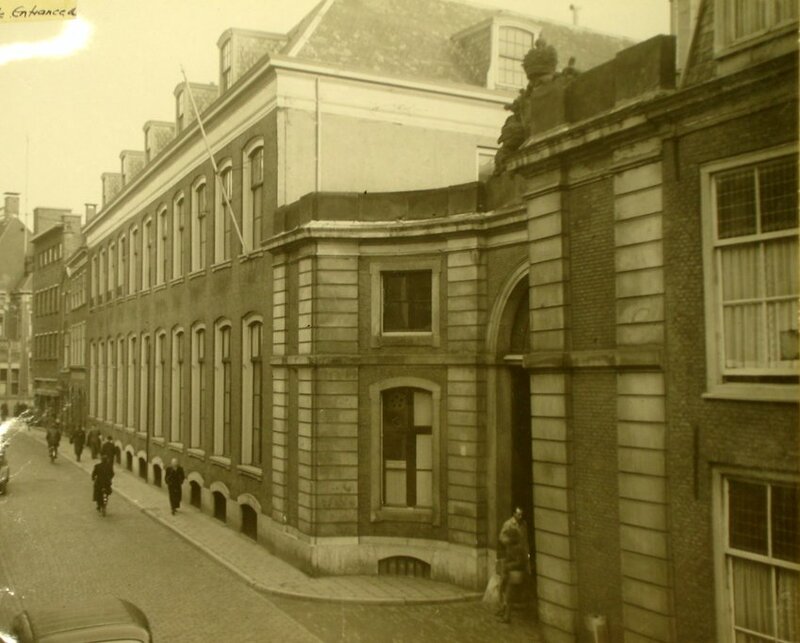 Offices were leased at 18 Parklaan before the property was bought in 1955 for £7,500. The residence was leased at 14 Mecklenburglaan since at least 1961 and moved to 78 De Laurenstaan, which was bought in 1973 for £72,000.